New Registrations for treatment are done free of cost on OPD days from 9 am to 11 am. Patients’ record files are issued that are to be submitted back in the Records section after the treatment/ consultation is received and cards are given to the patients to be produced to access the files on each visit to the Institute. Examination in PMR OPD for the Diagnosis making and rehabilitation management prescription,referral to allied departments and investigation facilities - Radiology /Pathology/ Electro-diagnosis/ foot pressure scanning and uro-dynamics etc., Patients requiring Reconstructive Surgeries are given a date of admission for surgery (normally not exceeding 3 months) which is coordinated with the trial date of the appliances and the entire procedure is completed within the shortest possible time. Pre-therapy evaluation of impairments and functions in the various Departments. Delivery of prescribed therapies in physiotherapy/ occupational therapy and/or speech therapy departments. 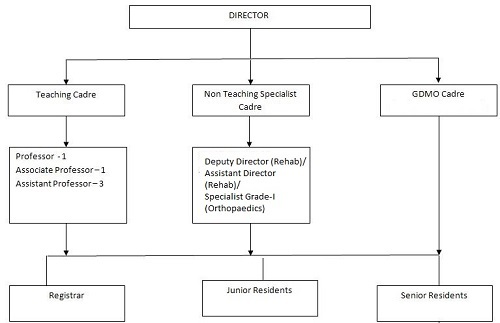 Appointments are given based on availability of staff and no. of patients to be treated. Measurement for prescribed orthosis/ prosthesis. Patient is assessed for fitment and quality of the appliance in P&O clinics and the appliance is then finalized. The process requires time varying from few hours to few weeks. The services of medical social worker and vocational counselor are utilized whenever required. 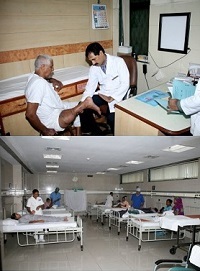 The patients are admitted to the ward, if required, particularly for surgical or long term supervised management. Wherever required patients are provided training in the Vocational Training Workshop and referred for Employment. Assessment and Issuing of Disability and other certificates. Cases requiring special attention and detailed discussion and rehabilitation planning by the rehabilitation team are discussed in special clinics, by giving prior appointment.